SHORTLISTED FOR THE JAMES TAIT BLACK PRIZE FOR FICTION WINNER OF THE CWA JOHN CREASEY (NEW BLOOD) DAGGER (award for the best crime novel by a debut author)A dark and powerful debut novel set in the hardscrabble American heartlands. 'If I knew for a certain'ty that a man was coming to my house with the conscious design of doing me good, I should run for my life...'After trying to help Benjamin Pearl, an undernourished, nearly feral eleven-year-old boy living in the Montana wilderness, social worker Pete Snow comes face-to-face with the boy's profoundly disturbed father, Jeremiah. With courage and caution, Pete slowly earns a measure of trust from this paranoid survivalist itching for a final conflict that will signal the coming End Times. But as Pete's own family spins out of control, Jeremiah's activities spark the full-blown interest of the FBI, putting Pete at the centre of a massive manhunt from which no one will emerge unscathed. 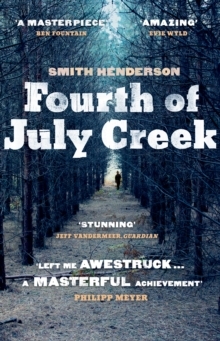 In this shattering and iconic novel, Smith Henderson explores the complexities of freedom, community, grace, suspicion and anarchy, brilliantly depicting America's disquieting and violent contradictions. FOURTH OF JULY CREEK is an unforgettable, unflinching debut that marks the arrival of a major literary talent.